ALMER WILLIAMS was born on January 28, 1940 in Camden, Arkansas to the union of David and Patience Williams. Almer or “Junior,” as he preferred to be called, was a very hardworking man and a jack of many trades. He worked as a cargo courier for Midtown Services, a car customizer at Broadview Lincoln Mercury, and a foreman in a factory. Likewise, he was a bus driver for the Regional Transit Authority in Cleveland, Ohio until his retirement. Junior bravely and honorably served in the United States Army during 1957-1958. Junior was very outgoing and outspoken. He was a man of his word. He loved to smile and his laugh was contagious. One of his favorite things was to say, “look at that joker” and it would make people laugh. 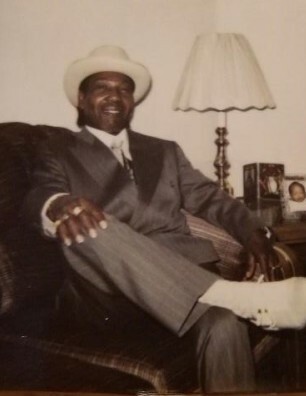 He also liked to watch western movies, and listen to the blues; and when it came to fashion, Junior was a sharp dresser. If you ever had a problem, Junior was the go to person because he was easy to talk to and would always give sound, but stern advice. It was that kind of love and firmness that characterized him as the definition of a “real man.” He accepted Jesus Christ as his Lord and Savior, and he always accepted life on life’s terms. Junior loved all his family and friends, and even in his passing his memories will live on forever. He leaves to cherish is memory, his wife Corrine Williams; sisters, Geraldine Johnson of Cleveland, OH, Martha Summers, and Elsene Blair (preceded in death) of Buffalo, NY; daughters, Carol Patience Williams (Stanley Kidd), and Cassandra McDonald (Robert Johnson), of Cleveland, OH, and Lavinna Bell of Buffalo, NY; sons, Bobby Williams, David Holcomb, Solomon Holcomb, and Andre Williams (preceded in death) all from Cleveland, OH; grandchildren, Devante Young, Gunnar Williams, Zayionna Williams, Andre Demetrius Jr. Williams, and Demetrius Andre Jr. Williams all from Cleveland, OH, and Kaylani Foot of Buffalo, NY, and a host of other grandchildren, great, and great-great grandchildren, cousins, family, and friends.